Bishop Chito Tagle, Bishop of Imus, blesses the Pilgrim Icon of Virgen de la Soledad. 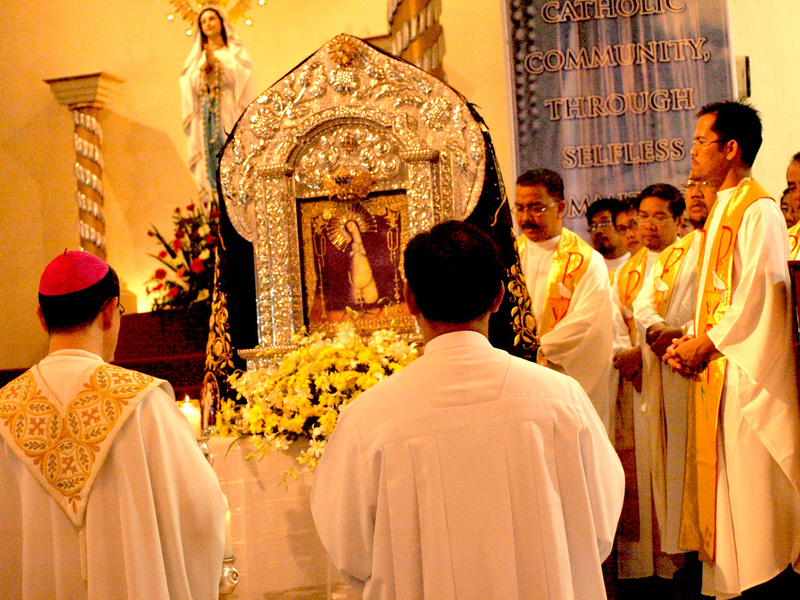 On August 6, 2009 Imus Bishop, Luis Antonio G. Tagle, blessed the Cofradia's Pilgrim Icon of the Virgen de la Soledad at the Opening of the Year of Priests for the Diocese of Imus, at the Parish Church of Our lady of Lourdes, Tagaytay city, Cavite. In the presence of the Diocese's Clergy, he invoked the loving maternal intercession of the Blessed Virgin Mary, and granted his Episcopal Blessing to the group, as it commences it's series of "Dalaw Soledad" to be done in various communities in and out of the Province of Cavite. Bishop Chito Tagle, Bishop of Imus, blesses the Pilgrim Icon of Virgen de la Soledad in the presence of the Imus Clergy. Bishop Tagle's endorsement for the Cofradia's DALAW SOLEDAD.